I guess it’s time to dish out some more magic into this thing. Sheesh, crappy average blog postings per month and we’re supposed to be committed to bring you nothing but the best in everything sugoi. For those of you who don’t know who Stephen Fry is, stop watching Pinoy Dream Academy and those other brainless Pinoy TV and start watching some British TV. (Yey! Pelt me with stones for being unpatriotic. Come on, PDA and PBB are all brainless shows. Piff!) He’s that genius of a Brit who happens to be a writer, director, actor, blah, blah… You might also know him as the other half of the Fry and Laurie comedy tandem. Laurie as in Hugh Laurie – that British bloke who plays Greg House in House MD. Anyway, Stephen Fry has just started blogging and he’s also writing about games and gaming. Here’s what he has to say about his pink DS Lite. 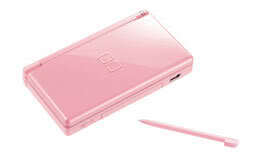 My DS Lite is pink. There was so much demand earlier this year that they couldn’t be had for bribes, sexual favours or worse. Unless you accepted girly pink. The moment you open it, you are taken back to the old Game & Watch days but can see why the DS has succeeded so well with the middle class, the middle-aged and the Hello Kitty/My Little Strawberry Shortcake Pony set. You set up in a twinkle and then play on two screens, one of which accepts stylus input and touches. He goes on into comparing it with the unimaginative PSP, and boy do I agree. It was a toss coin thing for me on how to spend a good month’s pay and I took the DS over the PSP. Never mind if I could actually watch hi-def pr0n on a PSP. Handheld pr0n is for wankers anyway. Can’t wait for his take on the Wii.